It's said that the Greeks in the sixth Century B.C. started the tradition of the wedding toast. Greeks poured wine from a common pitcher, so the host would drink from his glass first to ensure the guests that there was no poison in the vessel. While you certainly won't have to convince your guests there's no poison in their beverages, toasting has become a tradition at weddings to wish health and happiness to the couple and to the guests attending the event. The best man starts the festivities with a toast to the beautiful bride. The second toast is also done by the best man and is to the bride and groom as a couple. The third toast is done by the and groom is meant as a response to the best man's toast. He also typically includes a few words to his bride, thanks the parents and the wedding party. Toasts from other people in the wedding can then begin. You may want to limit who is giving toasts to keep this portion of the reception from dragging. The second to last toast is again done by the best man to thank the groom on behalf of himself and the rest of the wedding party. Finally, the last toast of the evening is from the father of the bride. He thanks all the guests on behalf of himself and his wife. This indicates the official start of the party. That's a lot of CHEERS! Be sure to raise your glass in style with a pair of sparkling, personalized wedding champagne flutes. 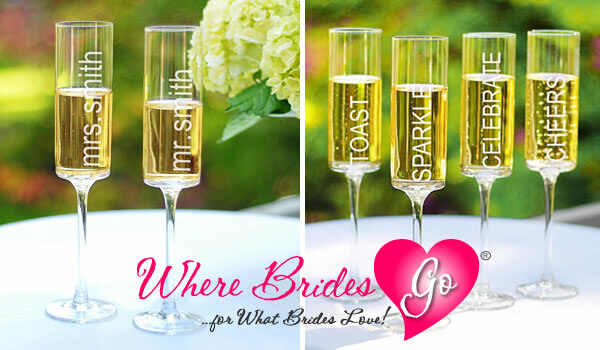 The champagne toasting flutes at WhereBridesGo.com are beautifully designed and are sure to become an instant keepsake from your wedding.